There are no important economic reports in New Zealand therefore NZDUSD is chiefly under the influence of economic reports in the US such as Durable Goods Orders and GDP Growth Rate. 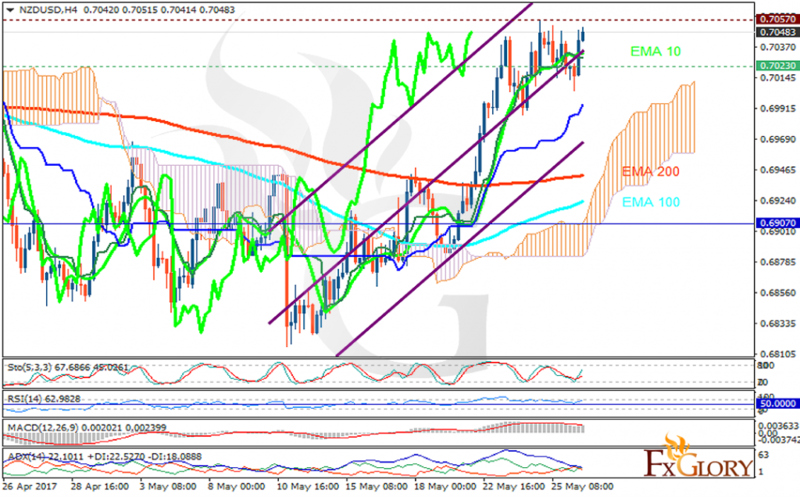 The support rests at 0.70230 with resistance at 0.70570 which both lines are above the weekly pivot point at 0.69070. The EMA of 10 is moving with bullish bias along the ascendant channel and it is above the EMA of 100 and 200. The RSI is moving in overbought area, the MACD indicator is in positive territory and the Stochastic is showing upward momentum. The ADX is not showing any clear signals. The price is above the Ichimoku Cloud and the Chinkou Span. The Tenkan-sen is showing a horizontal trend while the Kijun-sen is showing an upward trend. Indicators are showing upward momentum therefore buyers can target 0.71 in case of price growth.